Pour out that last drop of sweet tea and transform your leftover mason jars into homemade luminarias. Maybe it’s the memory of catching fireflies in them as kids, but something about mason jars just begs for illumination. Fortunately, creative folks have come up with ways to light up those old containers. If you don’t already keep a collection in your cabinet, score affordable mason jars by the dozen at places such as Ace Hardware ($6–$10 each; locations around the city) or snag a few vintage versions on eBay. Using a hammer and nail, carefully punch one-inch holes in each mason-jar lid to make room for the electrical cord. Insert a low-watt bulb in each jar, feeding the cord from a hanging lamp kit ($10–$12 at Home Depot, locations around the city) through the hole in the lid, and then screw the lid back on the jar. The next step is up to you: You can stick as many hooks ($3 at Home Depot) in the ceiling as you have jars in a close cluster and hang one cord per hook at varying lengths from a nearby electrical outlet. Or, for a cleaner look—and slightly more complicated endeavor—use a ceiling light plate ($5 at Home Depot). Drill holes into the plate for each cord, pull the lights through the holes to your preferred height and tie a knot at the top to secure them behind the plate. Unless you’re superhandy, installing the latter option in your ceiling will require an electrician. For an easy semi-homemade alternative, purchase a canning-jar lamp kit ($15 for a two-pack at amazon.com). Top it off with a lampshade and fill the jar with colorful contents such as random buttons or stones. 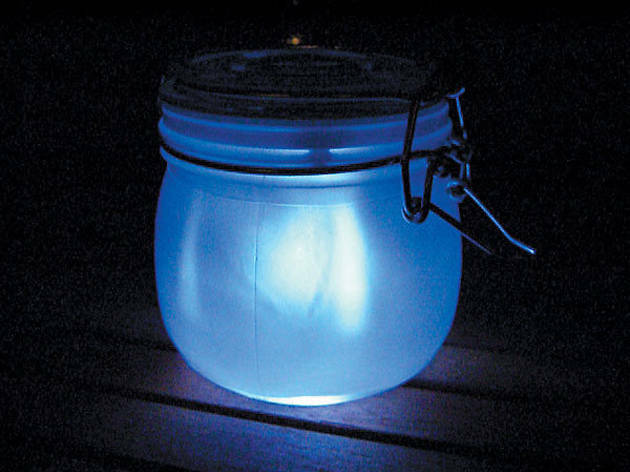 Instructables’ solar jar, inspired by Tobias Wong’s Sun Jar, comes the closest to offering the flickering, glowing effect of lightning bugs. Here’s how to make it work: Using a knife, dissect a solar garden light ($4 at Home Depot) to remove all of the parts. Place the separate parts (battery, solar panel, etc.) inside a mason jar, using Blu-Tack ($6 at findtape.com) to fit them snugly back together. Coat the glass with frosting spray or create the same hazy effect by wrapping a strip of tracing paper around the inside of the jar. 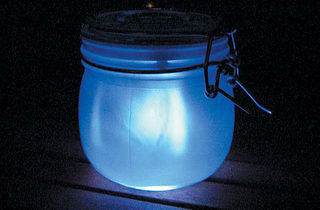 Then display the jar by a window with strong sunlight to keep the batteries charged.